I’m not sure if I know how to pronounce the title of this post correctly. But En Papillote is a method of preparing fish, chicken or beef in sealed up little packages so they can steam in wine or another flavorful liquid of your choice. It’s a healthy and delicious way to enjoy your meal, perfect for entertaining and a great way to reduce calories. I am sure this would work well with a little butter and cream too. This was so delicious and easy to prepare that I decided I need to go out and buy more parchment paper . Many more dishes will be prepared in these little packets. For today’s recipe; fresh wild halibut was baked and steamed in parchment paper with white wine, lemon juice, asparagus and fresh thyme. The end result was soft and buttery; every bite melting in your mouth. When serving be sure to open packets at the table to allow everyone to smell the aroma, they will be in heaven. Take 2 pieces of parchment about 12 inches long. Set halibut in the middle of the parchment, season with salt and pepper. Place asparagus, leeks, lemon slices and your choice of fresh herb. Overlap parchment paper and then fold tightly around the food to create a seal. Add wine before sealing pouch completely. Add parchment packets to a large cast iron skillet and place in oven. Bake until firm to the touch, about 6 to 12 minutes depending on the thickness of the fish. Remove from oven. Be careful of the steam when opening. Remove lemon slices and herbs. I love cooking en papillote, but it's been ages since I've done it. :Your bailout looks wonderful! Thanks Beth, you can't go wrong with fresh wild fish. This sounds like a great way to prepare fish–I love all the flavorings in this! Thanks Nancy, you can't go wrong with lemon and asparagus. Thanks Tandy, I have not either, not sure why. Looks like a heavenly spring supper Cheri. I imagine the white wine makes the asparagus and fish sing flavor! Hi Kim, yes it does, it was so moist. What a delicious looking meal! I love cooking meats enclosed. It keeps the dish so moist. Hi Julie, I can't wait to try other meats as well. Take care! What a lovely recipe, perfect for this time of year when you want something filling but light. We love preparing fish like this. Everything just tastes so fresh! Hi Dannii, you are so right, I will be preparing fish this way again. Halibut is my second favorite fish and I would eat it once a week if it weren't so expensive! This recipe is perfect simplicity with it's Springy flavors and ease to prepare. I will be making this very soon, Cheri. Thanks! Hi Robyn, so funny, halibut is my second favorite fish too, salmon is my favorite. Have a great week. i haven't made anything en papillote but it's a very intriguing method! this looks like a light, delicious meal! Thanks Grace, it is a great method, our fish was very flavorful and moist. Thanks Karen, I bet this would be wonderful with snapper. Fish in parchment is one of my favorite meals, and this looks so light and refreshing! Thanks Marcie, it's now one of my favorites too. Thanks Dena, it's already getting hot here, our meals need to be somewhat light. Same here, love cooking fish, especially salmon en papillote - it is such a healthy and wonderful way to prepare glorious food! You did a wonderful job with your creation! I love halibut and this sounds like such a delicious recipe, Cheri! So light and flavorful. Well done! Thanks Susan, halibut and salmon are my favorites. Cheri, this recipes looks great. Loving the parchment idea. Thanks Linda, this was a quick and easy method. I love halibut and this sounds fabulous. Our local grocery store will now put any fish in a cooking bag with herbs and spices, which is a great thing when I don't feel like getting out a piece of parchment. I'm lazy, I know! That's really cool that your local grocery store does that Abbe, take care. Great flavors and I love fish in parchment, Cheri. Read a recipe the other day making apricots in parchment. It looked so good...am now waiting for apricots to appear in the market. Oh that sounds scrumptious Barbara, love apricots. Thanks Mike, halibut is delicious. Mrs KR majored in French in college, so she always enjoys correcting my pronunciation. :-) Anyway, love anything cooked en papillote -- looks fancy, but really isn't. And always tastes wonderful. Even though I can't pronounce it. Thanks John, haha that is funny, I totally understand that. Thanks Agness. Have a great week. 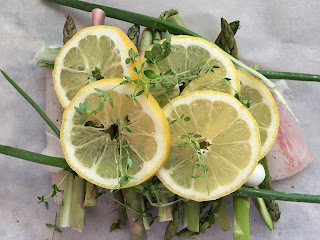 This is so flavourful ... love the pairing of lemon and asparagus! Thanks Karen, I just cannot get enough asparagus right now. A good seafood dinner is seriously one of favorite things in the world and this looks divine, Cheri! Thanks Marcelle, I'm a huge fan of seafood too. Cheri - this is one of my favorite cooking methods! Yes, adding cream is a great idea, but what I like most about it is that you can prepare a healthy meal, the flavorful meal, and a beautiful meal. You are so right David, also now that it is getting warmer lighter is good.